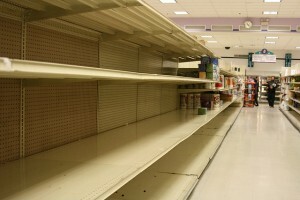 If you are shopping and the store has no more stock of an item on a shelf you can ask them to issue you a Rain Check. This Rain Check will guarantee the store will honor the sale price of that item the next time it is in stock. Note that most Rain Checks expire 30 days after you receive them so I hang onto mine in the same area of my binder as the Register Rewards, +UP Rewards, and Catalinas so I know to keep an eye on them and not let them expire on me. When is a good time to ask for a Rain Check? Usually the times I ask for a Rain Check is when I go to a store all excited to take advantage of a deal only to be heart broken and find there are no more in stock. But there are other times. Sometimes I may be the one to take the very last of an item off the shelf. I pick it up and think (sigh) I really was hoping to grab three of these package of raisins. So then when I am checking out I ask them can I get a Rain Check for two more packages of raisins? What does a Rain Check look like? You may notice the sale price and regular price are not filled out on mine. You will see why in the second picture. The next best bet which I actually prefer is to have them staple the item from the current ad. Here is the sale the store was having. It was for $3.99 for a box of Pot of Gold Hershey’s then you get a $2 +UP reward to use later. By having them clip the actual ad and staple it to the Rain Check it eliminates the need to have to explain how this sale worked. With a deal such as this it would have been difficult to write out. How much should I put for the Quantity? The first thing I would look at is there a Limit? A lot of times sales will limit you to a certain number to make it fair to all of the other shoppers. If there is a limit that is usually the number I put in that spot. If not I use my rule of thumb which is that sales seem to run in 12 week cycles. How many of these items does my family need for the next 12 weeks. For the sale above you may notice I picked five. I felt like this was a fair number for my family for three months. The answer to that question is only one you can answer. Plus, something to also consider is any coupons you may be wanting to stack with this deal to make it sweeter. Such as the deal above for the Pot of Gold deal. I also had a coupon for $1 off which would have made this deal only $1 out of pocket expense (yep I was bummed to see they didn’t have any more in stock). I have to think am I still willing to pay $1.99 for this item if it comes in AFTER my coupon expires. If not I may not want as many as I had previously thought. Like I said this is something you have to decide according to your budget. Sometimes you can have what is called the Perfect Couponing Storm. You can have a Rain Check for an item at a sale price only to have a coupon in the next two weeks come out to make the deal even sweeter. Who knows, crazier things have happened! Even if that doesn’t happen I highly recommend consider shopping with Rain Checks. I have yet to run across a cashier that was not more than happy to issue one to me. I would love to hear your experiences with shopping with Rain Checks. Or if you have any questions that I may not have answered regarding this subject, please feel free to leave them in the comment section and I will do my best to answer your questions. Abby is the author of the blog Steals Plus Deals (formerly known as Steals & Deals – just a slight change in name). Head on over there & you’ll see a new, fun retro-chic look for Steals Plus Deals! Abby is a stay-at-home mom of three children & she lives in the Seattle-Tacoma area. However, her blog focuses on deals for people around the country. She scours the web to find the best online deals from sample sites, daily deal sites & more! I don’t understand how we can get +ups on rainchecks since they print out automatically. Thank you! I use rain checks for CVS because they last forever. They are great to use when rolling EB. I went on black friday and picked up some of the deals, got rain checks for the rest and just now went back to use the EB and rainchecks. I still have one raincheck because they are still out but I can wait. The place I probably most often get/use rain checks is Fred Meyer. I tend to only really have a problem during the “Founder’s Day Sale” that happens once a year. They usually have killer prices on Tillamook cheese/yogurt which I love. I also will get a rain check to stock up on 1 liters of pop to take to parties/events we might have coming up if they are out of stock (which sometimes happens). I agree with stapling the coupon to the rain-check (it makes it much easier) plus it doesn’t waste the time of the cashier having to totally fill out the form. I’ve never had a problem using them at a later date. I’ve wondered how the drug store rain checks work as well…if you were supposed to get UP rewards and you get a raincheck, do they just subtract that amount from the sale price of the item when it comes in as well? Or are they somehow able to force print an UP reward? If they do take that into account, that would be GREAT! I knew I could get one for the sale price, but if rewards are included, I might just ask more often! I just got a rain check at Rite Aid the other day. I was so excited to do the Airwick candle deal and they were all out. The manager filled out the rain check for the sale price, plus an additional $3 off my total since that was the Up Reward promo for that week. So, I’ll go back in a couple of days and do the deal, hopefully, even though the sale has ended. I love rainchecks! I use them quite a bit at Rite Aid…just as you said. On the Pot of Gold, they gave me a raincheck and attached the ad…when they came in, I got them for the $1.99 each ($3.99 – $2 up reward). I bought 10 and used the $1/1 manufacturer coupon. My cost OOP was $9.90 and it printed a $5 Up reward! I also use them from time to time at Albertson’s. Recently they had the Langer juice for $2.19 but were out so I got several different rainchecks at stores in quantities of 3. The next time doublers came out, I combined a raincheck, a $1/1 coupon and the doubler. My OOP was $0.19 each. ALWAYS GET A RAINCHECK IF YOU CAN. Hi I am so glad to see you guys are all enjoying my guest post! @Courtney I just recently went to use this rain check at my local Rite Aid to get my Pot of Gold chocolates. What they did was do a manual change to the ticket and I was charged $1.99 per box of Pot of Gold to reflect the sale that was going on at that time. I hope that makes sense. Please let me know if you have any other questions I would be glad to answer them if I know the answer! I appreciate all the input! I’m glad Rite Aid has been so helpful for you. My local one is on and off, I never know who will be working or how accomodating they will be, but I will certainly try! Thank you!